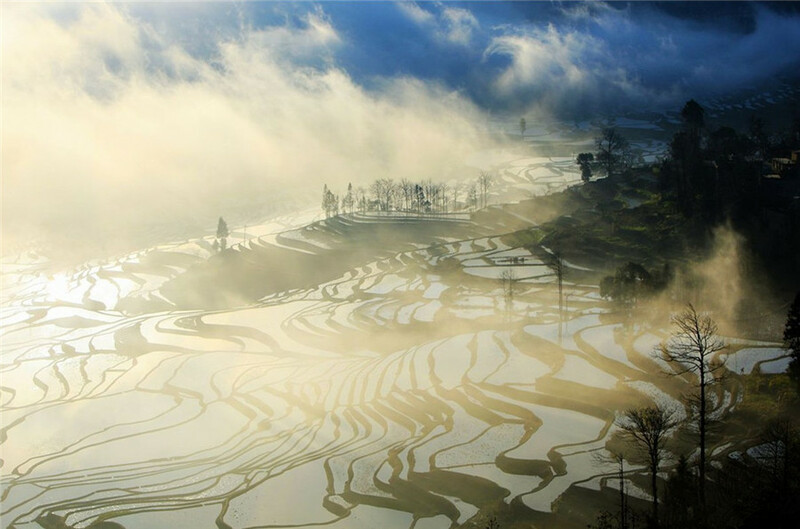 Why Visit Duoyishu Rice Terraces? 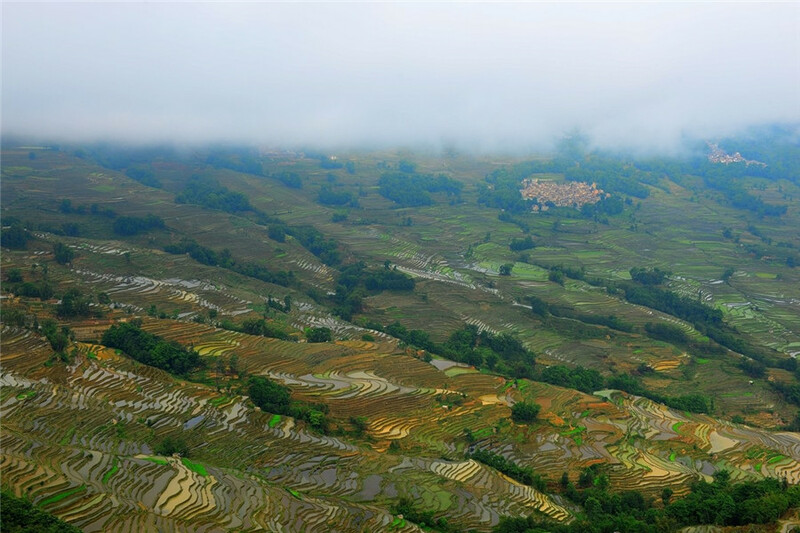 Duoyishu Rice Terraces, part of Honghe Hani Rice Terraces, was listed as World Heritage Site in 2013. This scenic area is the best site to watch sunrise over the vast rice paddies, sea of clouds and enjoy harmonious Hani folk life. 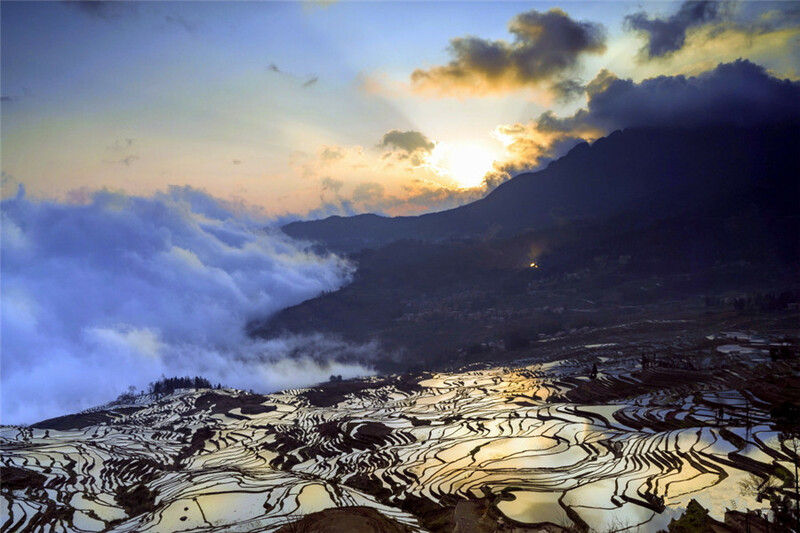 There is a ballad going in Yuanyang “If you travel to Yunnan, you should go to Yuanyang for the rice terrace together with the sea of clouds make it a mysterious wonderland”. 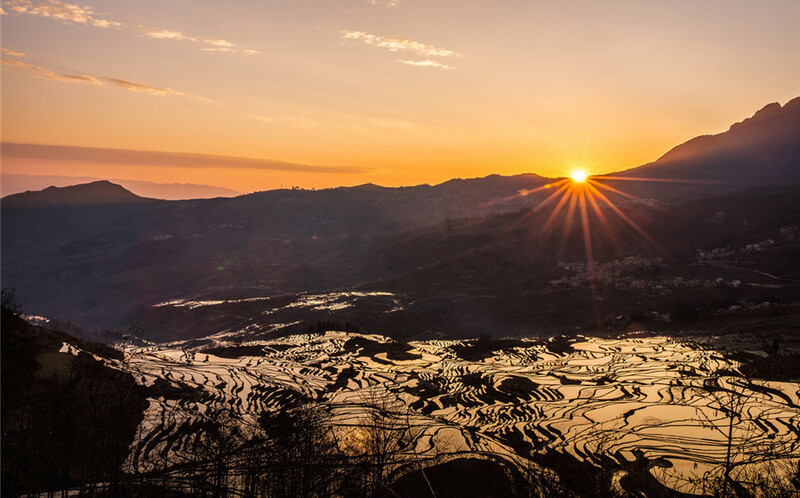 If you come to Yuanyang, you should never miss Duoyishu Rice Terraces for the amazing sunrise which makes you never want to leave. 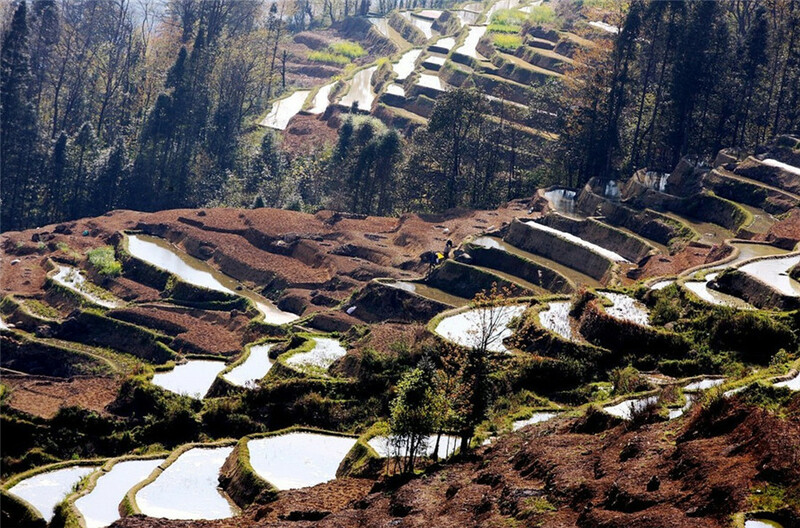 Duoyishu Rice Terraces, part of Honghe Rice Terraces, was listed as World Heritage Site by UNESCO in 2013. It is marked by spectacular terraces that cascade down the slopes of towering Aliao Mountain to the banks of the Hong River. Over the past 1300 years, the Hani people have developed a complex system of channels to bring water from the forested mountaintops to terraces. The rice terraces is a testimonial to demonstrate extraordinary harmony between Hani people and their environment, both visually and ecologically. 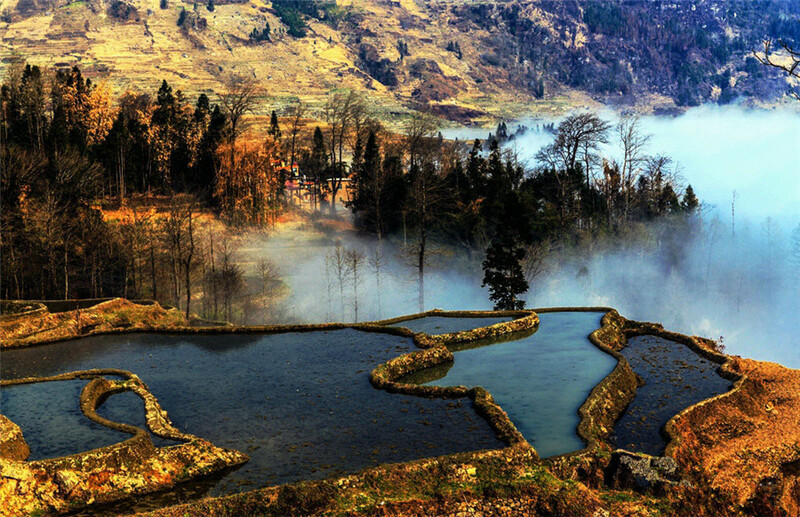 Duoyishu Rice Terraces scenic area has 400 hectare which is composed of Huangcaoling, Duoyishu, Aichun, Dawazhe, etc. 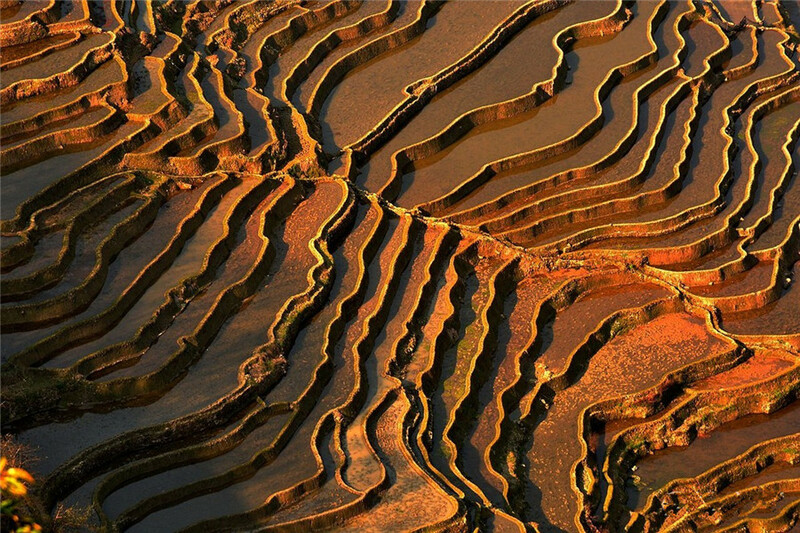 When the sun rises over the surrounded mountains, the rice terraces change its color into golden, shining brilliantly. The mysterious sea of clouds, special mushroom houses and beautiful rice paddies and working Hani people are very harmony. Duoyishu Rice Terraces Scenic Area got its name from the local Duoyi, a beautiful place inhabited by Hani people. 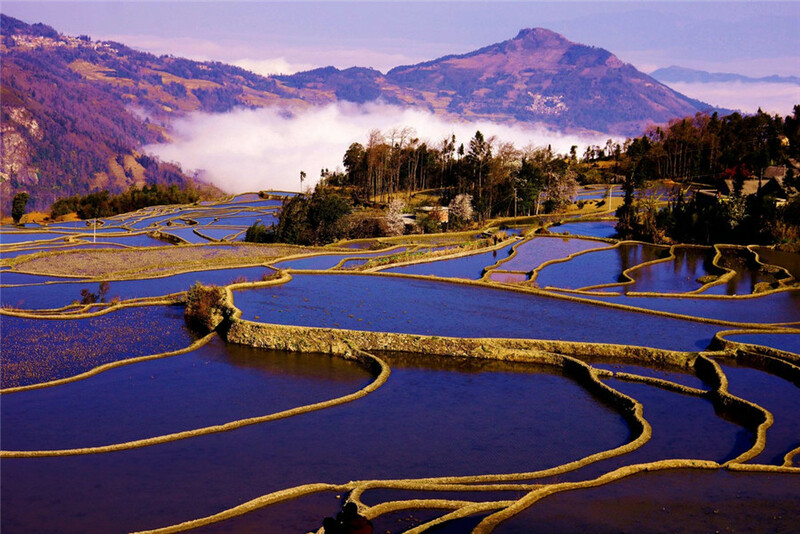 It is composed of Duoyishu Rice Terraces, Huangcaoling Rice Terraces, Aichun Rice Terraces and Pugaolao Village, etc. The altitude of Duoyishu Village is over 1,700 meters. The 9,700 acres’ of terraces below the village is the best spot to watch the sunrise. Early in the morning, when the bright sun comes up to the top of the mountain, sunglow lights half of the sky, and then the full mountain of terraces are glittering. It seems that the mountain is wearing such a colorful dress that it dazzles people’s eyes. The terraces here are always lost in the cloud and mist. The sea of clouds appears hither and thither and varies quickly. It is over the high mountain and on the next moment, it suddenly disappears without a trace. In the process of waiting, you will marvel at the extremely wonderful scenery and natural masterpiece, and you will be thrilled at the hard work of generations of Hani people. 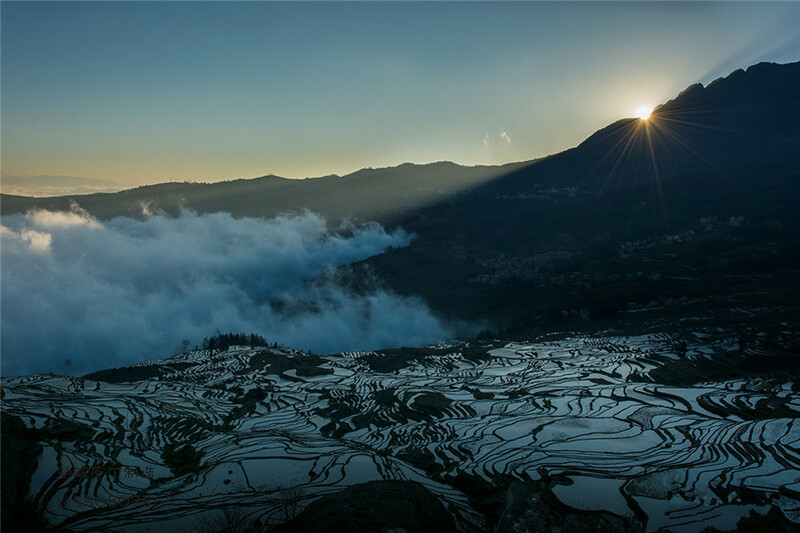 Duoyishu Rice Terraces is the best site to watch sunrise over the rice fields. In the early morning, the sunglow appears splendidly over the mountains and just a few minutes later, the gentle sun begins to show up and rise slowly over the top of the mountains. 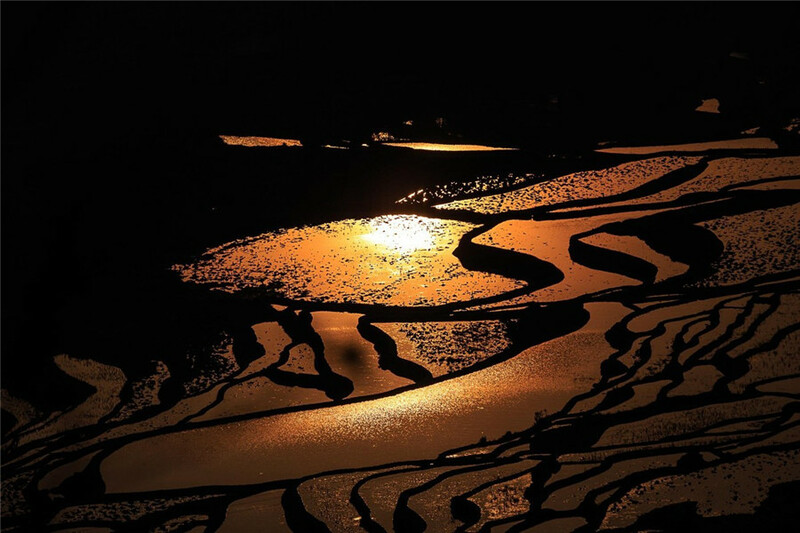 When the sun rises up the 6000-mu Duoyishu Rice Terraces, the whole villages turns bright and the vast rice terraces look like a mirror, radiating the rays of golden light. 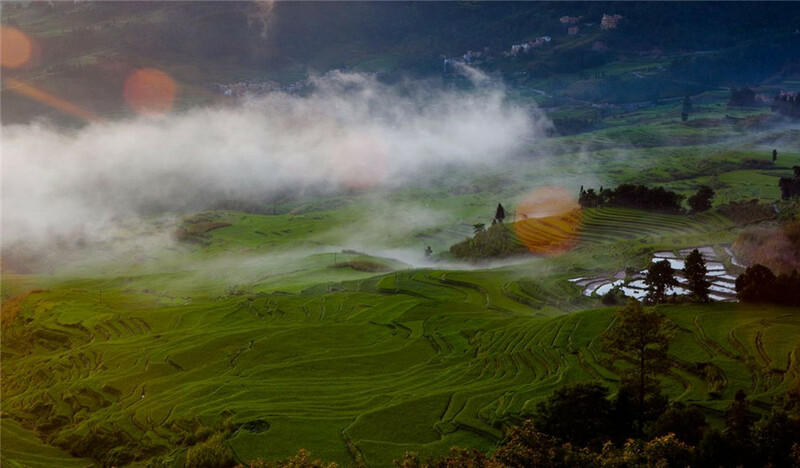 What makes Duoyishu sunrise the most beautiful is not only the golden rice terraces, but also the mysterious sea of cloud and Hani people’s mushroom-like houses. No matter you are photographers or not, catch the best moment to keep the amazing Duoyishu Rice Terrace sunrise with your camera. 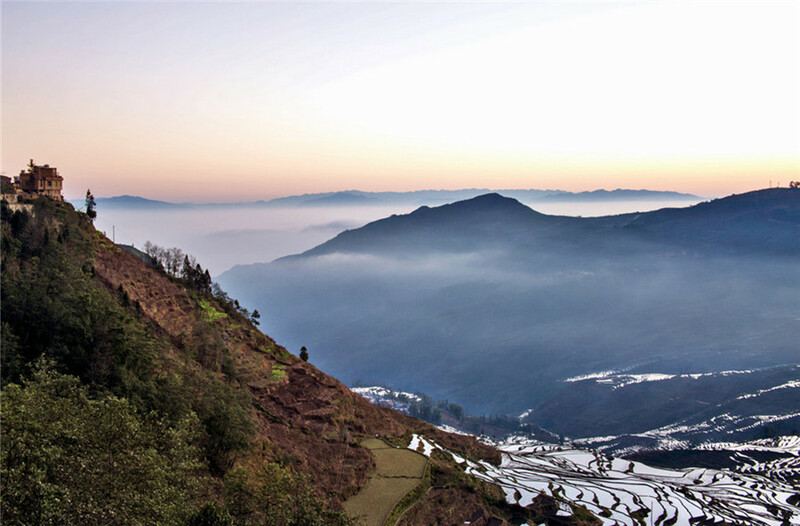 There are two view decks of Duoyishu Rice Terraces, one is located on the top of the Pugao Old Village, close to the Duoyishu Ticket Booth and the other one is located in Pugao Old Village, very close to the rice terraces. It is suggested that use the higher viewing deck to watch the sun rises over the mountain and photograph the brilliant rice terrace scene. And if you have more time, you can take a walk down to the village and reach the lower deck to catch more beautiful scenery. From the lower deck, travelers can hike down the paddy rice terraces and have more memorable time in the mysterious village. The sun rises up during 06:00~07:30 and usually around 07:00 in the spring time. If you are professional photographers, you’d better get up at 05:00 and arrive at the viewing decks around 05:30 to find a good location. Otherwise, travelers can come around 06:30. To capture the magnificent Duoyishu Rice Terrace, it is good to use wide angle (14mm~24mm, 17mm~35mm) and telephoto lenses (70mm~200mm or above). A tripod and lens hood will make your pictures perfect when shooting sunrise over the rice paddies. Also, polarizer and gradual change grey color lenses will help you get better terrace pictures. The weather of Duoyishu changes a lot and it is good to take waterproofing and damp proofing measure. And you’d better ask more advice from your photography guide. November to Next April: The best season to visit is from November to next April because the terraces are in irrigation period at that time. Both season has its own charm in Duoyishu Rice Terraces. 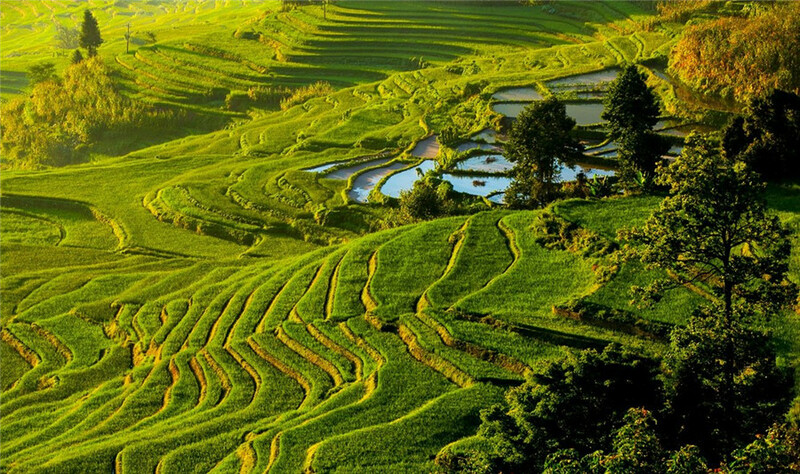 In spring, local Hani people and cattle are working in the fields, and the whole terraces turn into green. 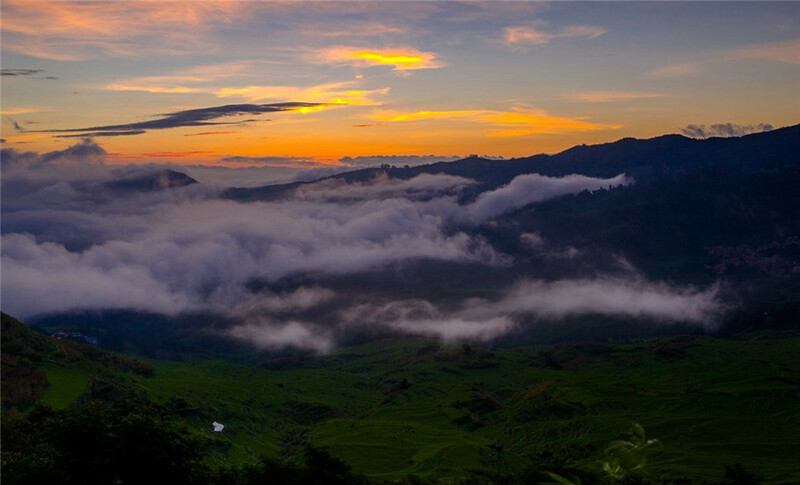 In summer, the sea of clouds over the rice terraces is changeable but more charming. 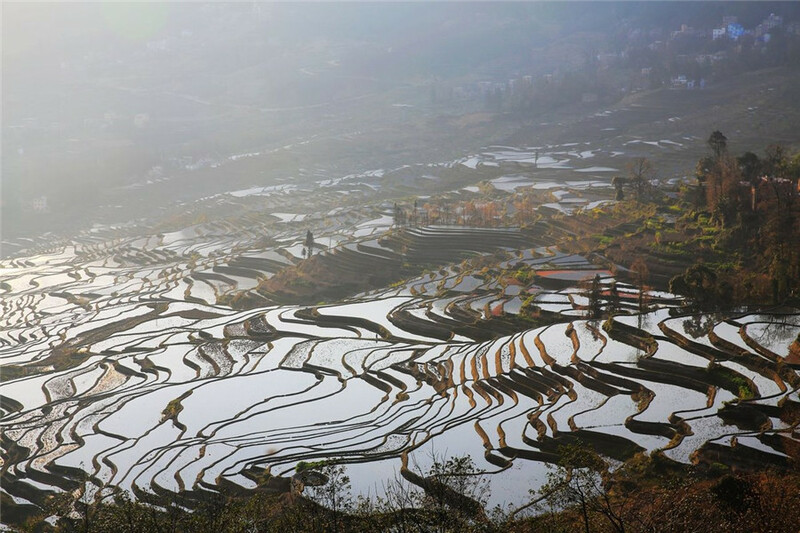 It is better to arrange 2 or 3 hours to visit Duoyishu Rice Terraces, we provide tourists with some tour routes to choose. 1. 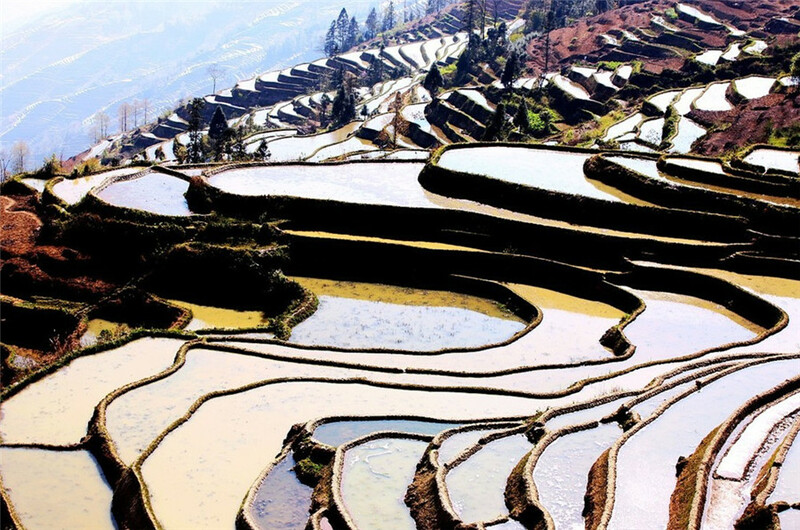 Nansha Town/Xinjie Town to Duoyishu Rice Terraces: Travelers may take long distance buses to Nansha Town or Xinjie Town from Kunming, Jianshui, and no matter which station you arrive at, travelers can take local minibus to Duoyishu Rice Terraces. 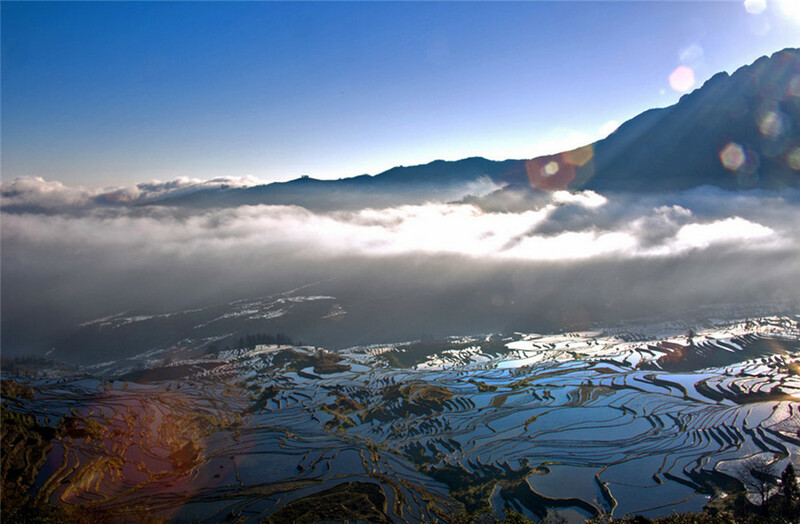 It takes about 1 hour from Nansha Town to Xinjie Town and 0.5 hour from Xinjie Town to Duoyishu Rice Terraces. 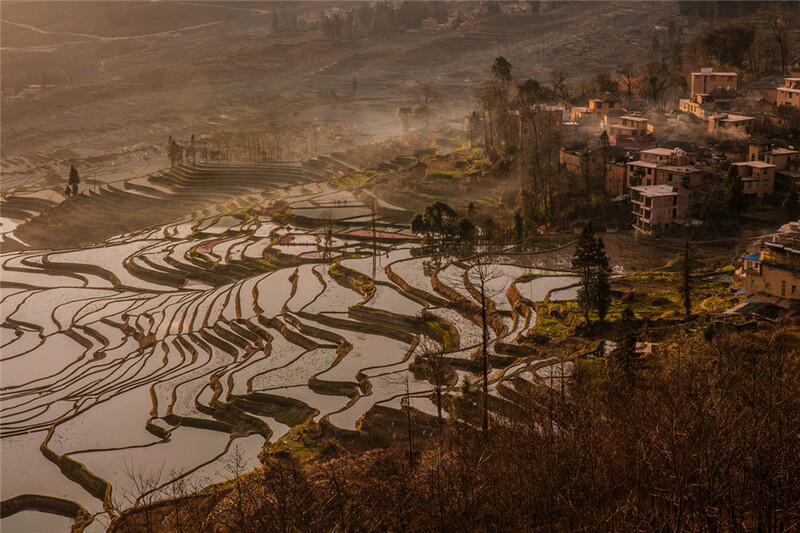 Duoyishu Rice Terraces is about 27 kilometers from Xinjie Town, 57kilometers from Nansha Town and about 375 kilometers from Kunming. 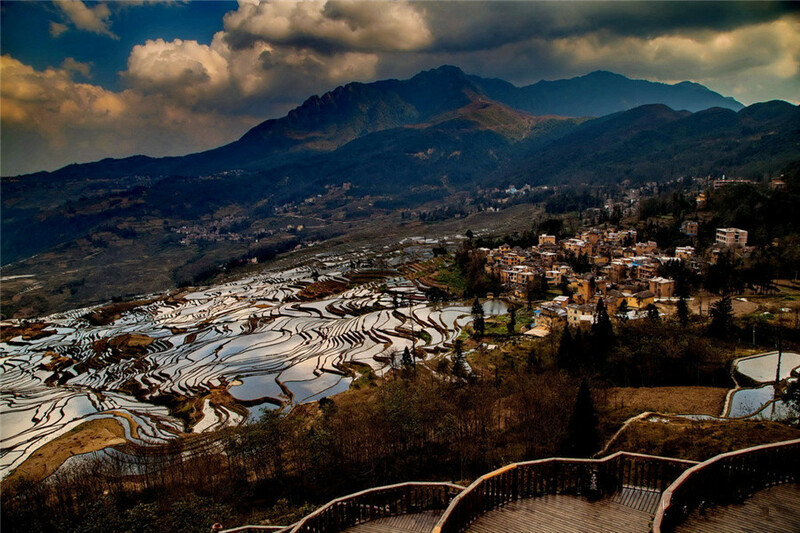 Travelers can take bus from Kunming to Yuanyang Xinjie Town (the old town) or Nansha Town (the new town) first and then transfer to Duoyishu Rice Terrace from Xinjie Town by local minibus. Nansha Town/Xinjie Town to Duoyishu Rice Terraces: Travelers may take long distance buses to Nansha Town or Xinjie Town from Kunming, Jianshui, and no matter which station you arrive at, travelers can take local minibus to Duoyishu Rice Terraces. It takes about 1 hour from Nansha Town to Xinjie Town and 0.5 hour from Xinjie Town to Duoyishu Rice Terraces. There are many hostels in Duoyishi Scenic Area and some are very close to the higher viewing decks with several minutes’ walking and some are close to the lower viewing deck in Pugao Old Village. For travelers who want to photograph, it is better to stay around the higher viewing decks. In Xinjie Old Town, there is only one 3-star hotel called Yuanyang Yunti Hotel. 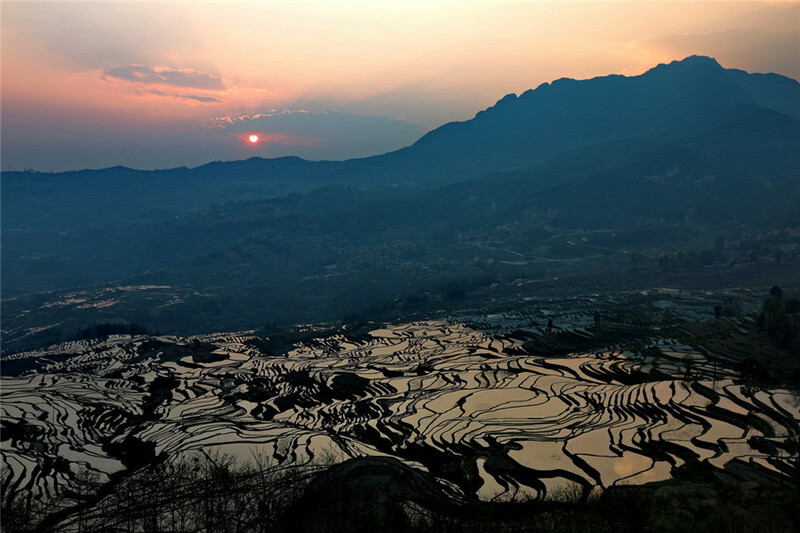 If you book Yuanyang Rice Terrace tour with us, you can feel free to use our private car service to transfer to Duiyishu Rice Terrace for the amazing sunrise. The visitors usually set off to Duoyishu Scenic Area in early morning. If you would like to find a good place to shoot the sunrise, you had better get up earlier. The temperature here varies greatly between day and night. Please pay attention to keep warm especially in early morning or at night.